Going ‘Green’ and making your home more Eco-Friendly has numerous benefits some of which include: Saving money, helping the environment, protecting your health, reducing your carbon footprint and gaining the ability to live a more self sustaining lifestyle. 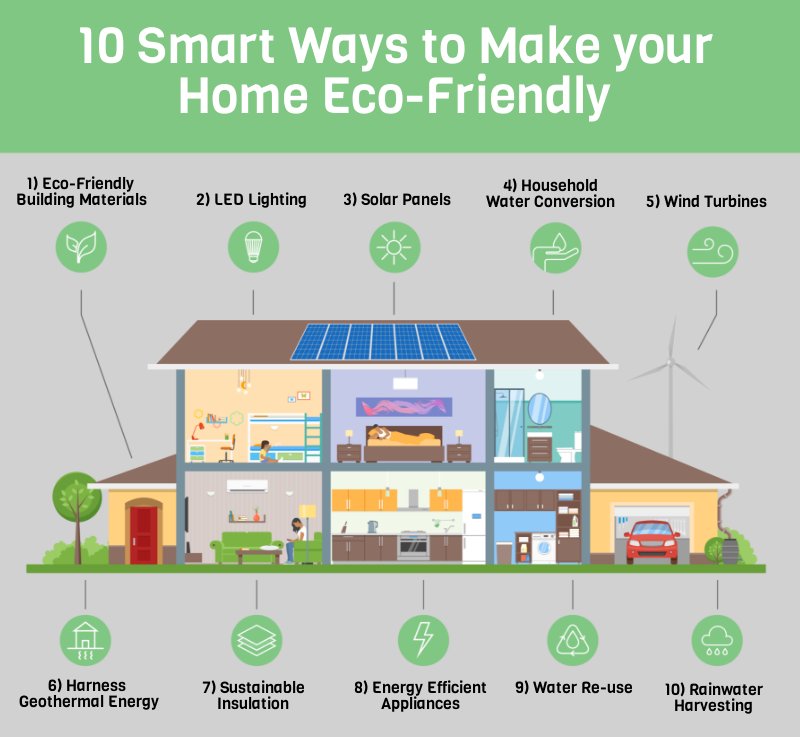 Below we’ve listed 10 different ways you can go about making your house more Eco friendly. In general, Eco friendly building materials have less of an impact on the environment so by investing in them you help do your part in protecting the environment. The materials are made from renewable resources and are not toxic. In addition, many of the materials are more energy efficient than the standard stuff which helps you save energy at the same time! LED lighting has been around for quite some time now. By switching to LED lighting not only can you save energy but you will save money as well because you are using less energy. According to thegreenage, when an LED bulb was compared with a halogen one, on average you can potentially save £12 a year on each bulb based on 5 hours usage per day. * In the long run – they will eventually pay for themselves. One drawback of solar panels is the initial cost however, as stated above, if utilized properly, in the long run they will pay for themselves. The use of water saving devices in and around your home will help in reducing water consumption and energy wastage. Water conservation helps prevent water pollution in nearby waters and local water sheds. Wind turbines are especially useful for us in this day and age living the ‘electricity generation’. It’s one of the few sources of renewable energy which also helps preserve the environment at the same time. Wind turbines are a ‘clean’ source of energy. It does not pollute the air like power plants do so you don’t have to worry about damaging the environment. Visit Saveonenergy for more information on how these power plants work and generate energy. A well insulated home will help preserve the heat in your home better resulting in less energy usage which in turn saves you money on your energy bills. To stay green while insulating, use eco friendly materials such as sheep wool, cotton, aerogel and icynene. If you’re wondering which appliances you should switch first, an infographic designed by Visualcapitalist states that your cooling and heating appliances add up to a whopping 47% of energy use in your entire home so it makes sense to start there! Another great thing about opting for energy efficient devices is that they limit greenhouse gas emissions without comprising performance. Water re-usage means basically means to recycle treated waste water for beneficial purposes such as agricultural and landscape irrigation, industrial processes, toilet flushing, and more. Reusing waste water significantly reduces the consumption of water in both urban and rural households as well as helping you financially as you are using and wasting less water. Rainwater harvesting collects and stores rain water for re use on site as oppose to letting it go to waste. Installing a rainwater harvesting system saves water consumption by up to 50%. This is by far one of the easiest and most energy efficient ways to save water, money and energy! Another benefit of going green many people sometimes look over is the amount of value these techniques can add to your home. Of course many people generally don’t want to sell their homes if they have worked so hard on making it as eco-friendly as possible but life being the way it is sometimes could change that. 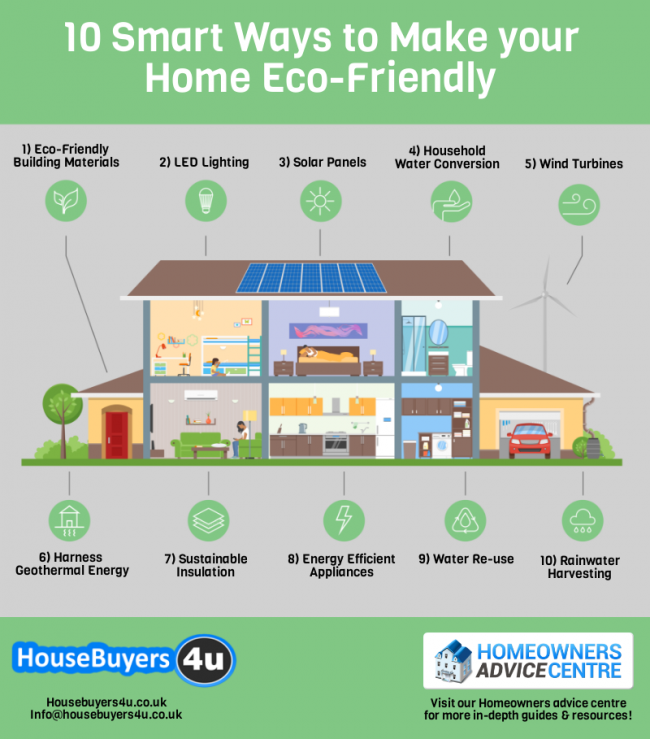 If you do ever find yourself having to sell up you can bet any home buyer who is conscience about the environment would take a keen interest in your home. This may allow you to dictate negotiations so even if you were to say something as far fetched as ‘I want you to buy my house for cash‘ – the perfect buyer might not question it and get straight onto putting the money together! That just about wraps up our 10 smart ways on how to make your home more eco-friendly. We hope our article has provided you with some useful information on how you as a homeowner can do your part to help protect the environment!